Pre-set to a torque of 5 dNm to ensure firm assembly of all WBT connectors while avoiding over-winding. Bits simple and easy to exchange. 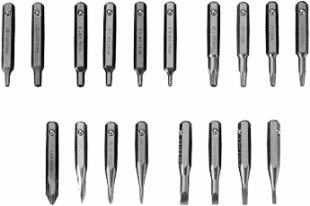 Fitted as standard with a Torx T.6 bit, suitable for standard WBT screws. For further bits see WBT-0484. 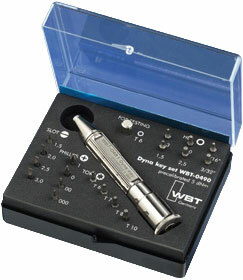 Contains the Dynamometric key WBT-0481 and the bit set WBT-0484. In convenient plastic case with transparent lid. 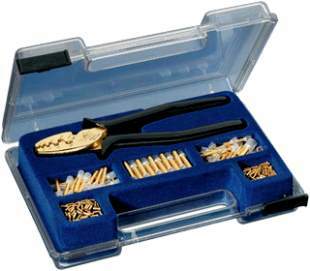 18 piece set of assorted 4 mm bits made from hardened chrome vanadium steel for the Dynamometric key WBT-0481. Individual bits available upon request. Made from chrome vanadium tool steel. Gold-plated. 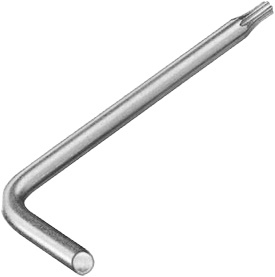 Supplied as standard in all end-user packaged products when fitted with Torx screws. We recommend the use of a WBT-0488 or WBT-0481 for industrially packaged products. Jaw for multiple spike pressing. Press form matched to WBT connectors. Dimensions marked on jaw in mm² und AWG. 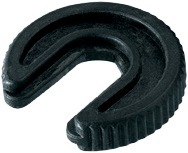 Suitable for cable end sleeves from 0.5 up to 16 mm² (20-5 AWG). 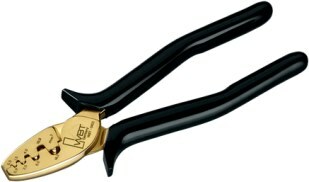 Contains the crimping pliers WBT-0403 and WBT cable end sleeves in pure copper from 0.5 up to 10 mm² (20-7 AWG) with and without insulation. In convenient plastic carrying case with transparent lid. 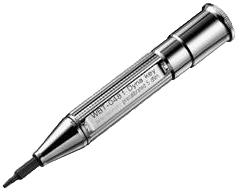 Enables the removal of the Central Contact Unit of the nextgenTM RCA connector WBT-0110. Holding device for the soldering of cable on to the nextgenTM RCA connector.